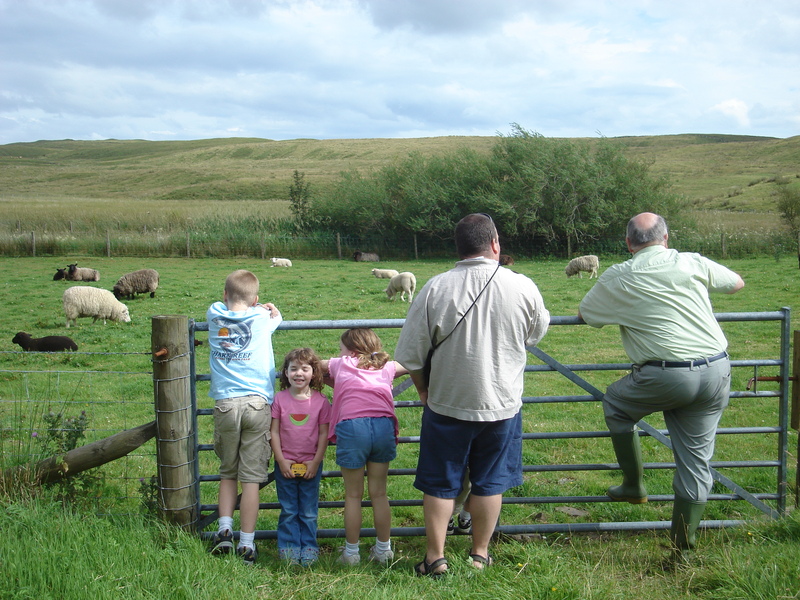 Five years ago, our family spent a month in Scotland. It was a clergy exchange–or it was meant to be, until my Scottish partner decided to spend the summer in Kenya instead of here in Canada. At any rate, we went to Kirkintilloch (just outside of Glasgow) where we stayed in a manse and spent our days sightseeing and getting to know the neighbours. I had always wanted to go to Scotland. I grew up Scottish country dancing, and the Presbyterian Church in Canada has its roots there. I even went to Thistletown Collegiate with its mascot of a scottie dog and its cheerleading uniforms of vests and frills usually associated with highland dancers. I longed to visit a country with such rich culture and history, see ancient ruins, and enjoy the weather. Yes, the weather. I love damp weather. A summer full of overcast skies and cool temperatures is heaven for me and my pale skin. I was so looking forward to escaping the heat and humidity of southern Ontario. And I was so disappointed. On the advice of a friend, I packed each of us warm clothes and one pair of shorts, just in case there was a warm spell. As it turned out, we needed those shorts over and over again to cope with the strangely hot, sunny weather. The congregation blamed the Canadians for bringing it with us! As everyone is complaining about an unusually cold, wet spring I have been feeling just fine. And yet, after several days in a row of not being able to do anything at all outside, I woke up this morning exasperated. I have plants that need planting, darn it. 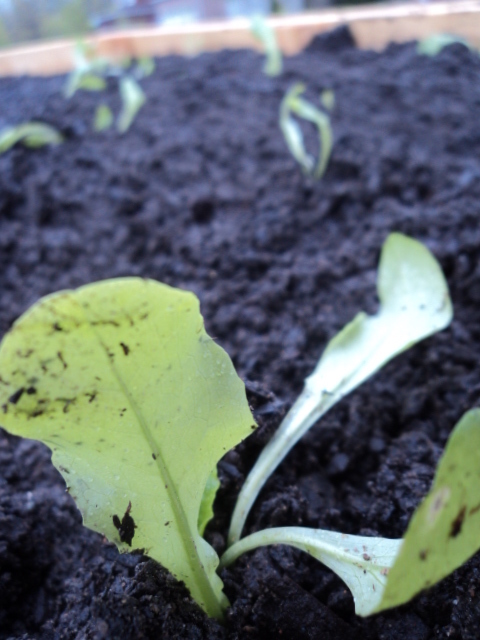 The leeks are all pot bound and the lettuce is pining for more daylight. I found a few more alyssum seeds that need to go in and my lupins are soon going to outgrow their temporary homes. So I bundled up this morning, put on my boots, and had a marvellous time in the cool, misty morning. 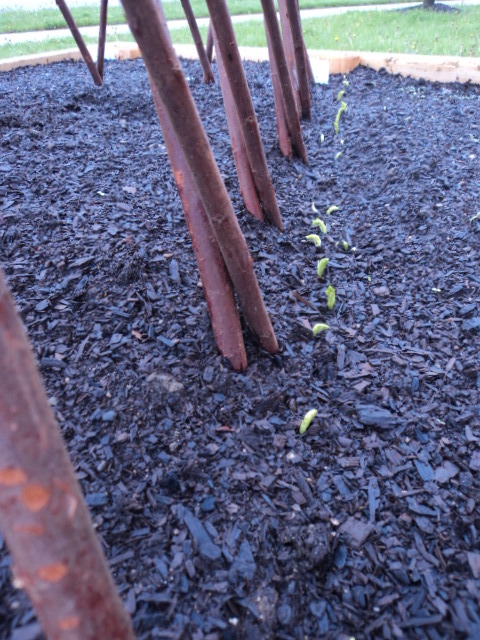 I appreciated the raised beds today, since I could work around the plants without tramping down the soil. It was also nice to perch on the sides of them instead of sitting on wet grass! I was surprised to find that I was not alone outside, despite the cold and damp. Across the street a team of landscapers arrived to tend to the lawn. (They reminded me of those guys who come out onto the baseball field to sweep up in between innings–they were obviously in a hurry to finish!) A robin came by to say hello, sitting two boxes over and watching me for ages. A man in a pickup truck leaned out the window and asked if the bike at the side of the road was garbage (it was). Another man went by walking his dog, and a teenager with a slushy and an ipod passed by without even noticing I was there. I suppose unpleasant weather, for all we talk about it, doesn’t have the power to bring the world to a standstill. People still need to get home. Lawns still need to be cut. Dogs still need to pee. I only lasted a few hours before needing to come in to warm my hands, but at least my leeks are happy. 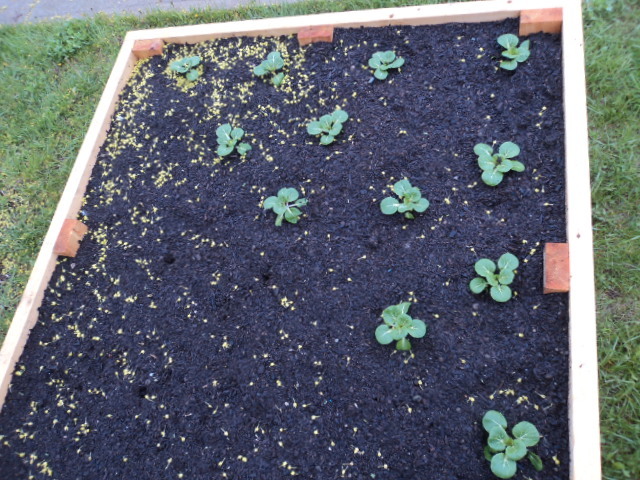 And so are the peas and the lettuce, and the baby bok choy, and the beets that have finally sprouted. Bad weather? What bad weather? The cold weather crops seem just fine indeed. This entry was posted in Uncategorized and tagged food, gardening, nature, seasons. Bookmark the permalink. OK – so now I am talking to your blog as I read along! Was it really 5 years since you went to Scotland??! Yes, the kids look younger – but was it really 5 years ago? Yes, the poor eggplants in my garden didn’t do very well at all last year: the rabbit ate them down to a nub in no time at all. And a boy named Leek?? I need to hear that story!